The financial media has been focused on Davos this week — the host of the World Economic Forum, which is attended by the world’s top global government and corporate leaders. Coming off of an ugly December for global financial markets, it’s no surprise the conversation is all about “slowdown.” It’s an odd conversation, given that the U.S. economy is growing at 3%, corporate earnings are running at record levels, inflation is low and unemployment is low. 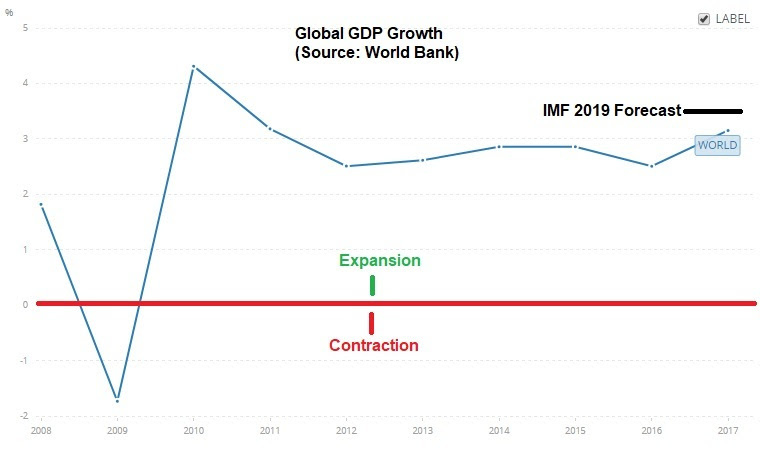 Even the IMF could only justify a small markdown on their 2019 global GDP forecast — from an already high level. For perspective, the IMF is now looking for 3.5% growth for 2019. Here’s how that looks relative to the past ten years …. As we discussed yesterday, it’s China, and the pressure of tariffs and reform demands on a vulnerable large economy that’s already drowning. And the broader view is that trade is being hampered by the Trump/China standoff – and therefore dragging on growth. With that in mind, listening to some interviews from Davos, the one that stuck out to me was the DHL CEO (the world’s leading mail and logistics company). He said trade is not at all on the back foot, rather its flowing more than ever before. So, the global growth slowdown talk is all about what might happen, not about what is happening. It’s about risk. With that, if China does make the concessions necessary to get a deal done (and they seem to have few options), we may end up getting a big upside surprise in global growth – especially given the very accomodative global monetary policy backdrop.